Over the years, I have worked with many intelligent and incredibly competent physicians that have earned my respect and certainly the respect and trust of those who were their care recipients. In the past decade, I have cared for only a few hospice patients who were physicians themselves. I think it must be both humbling and difficult to be the one receiving care and medical attention when your role was always the “director” of the medical team. I am humbled by his praise, and by his acceptance of the hand he was dealt. 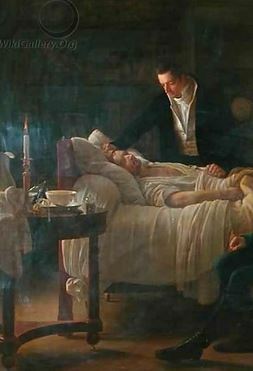 Having been the physician who studied and cared for every kind of pulmonary disease and disorder, he himself is dying from slow paralysis of his respiratory function, incrementally losing his ability to breathe, and one day in the near future his lungs will stop functioning altogether. But every day, he is making the huge effort to get out of bed, into a wheelchair that supports his now immobile limbs, and keep his mind actively learning. He tells me that life will have nothing left for him when he is no longer able to use his voice activated computer and read, communicate and learn. Stripped now of what has been years of an identity so difficult to release, he has learned, like we all must someday, the art of letting go. Rich and poor, wise and foolish, esteemed and scorned, we will all face this same realization: Naked we come…naked we will return. I have the hope that I could be as gracious as he. Phrases come to my mind describing this man: acquiescence when faced with the inevitable; humility amid great accomplishment; grace in spite of deprivation; and mastering the art of treasuring what is available today. Recognizing that this spring day truly is a gift. Thank you for sharing that gift with me. This entry was posted in end of life care, hospice story and tagged doctors dying, grace, humility, letting go. Bookmark the permalink.